A beautiful map of the British Isles. 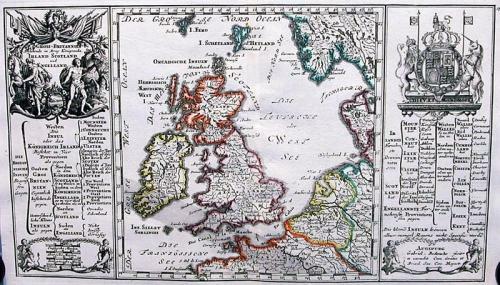 In columns on either side of the map is a division of the British Isles into its Kingdoms, Provinces and Counties. In the top left corner is an elegant title cartouche flanked by two men holding horses (Arab & English), whilst in the top right corner is a beautiful engraving of the Royal Coat of Arms flanked by a lion and a unicorn. Scarce. Fold(s) as given.